In a large bowl, stir together crushed granola bars, melted butter and sugar until well mixed. Press half of the mixture into a 9x9-inch baking pan that has been generously sprayed with nonstick baking spray. In a mixer, beat together cream cheese, sweetened condensed milk, whipped topping, almond extract and rum. Fold in nonpareils, reserving about 1 teaspoon for the topping. Spread whipped mixture on top of crust. Top with remaining granola bar mixture and sprinkle with reserved nonpareils. Cover with plastic wrap and freeze until firm, about 4-6 hours. For best results, remove the cake from freezer about 10 minutes before serving. Once upon a summer, we created a frozen cake concoction called ever-so-splendidly the Strawberry Crunch Cake. And the webwaves went wild. Clicks happened. Recipes were downloaded by the bajillions. Forks were tied to hearts. Strawberry crunch dreams were dreamed. It was the stuff of fairytreats. And so, we made more. First, there was the S’mores Crunch Cake. Which was joined shortly thereafter by the Snickerdoodle Crunch Cake. 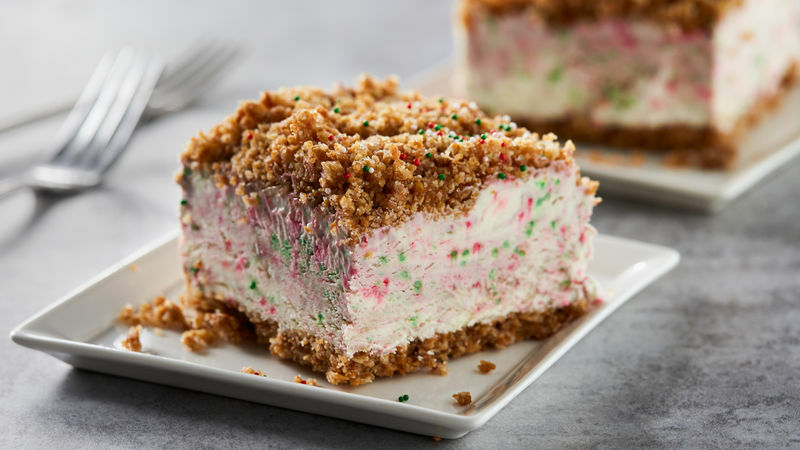 And once the holidays hit, and people couldn’t bear to live without their creamy, dreamy frocake, we went and whipped up the Candy Cane Crunch Cake. But, it wasn’t enough! Even if you made every one of our crunch cakes daily, there were still days between. And holiday parties were calling and begging. We need more, they said! Crunch our hearts out, they cried! Unwilling to leave the pleas of holiday cravings unheard, we grabbed a bowl and starting baking up another glorious version of this wickedly simple, no-bake crunch cake. Inspired this time by sugar cookies and rum, Christmas Crunch Cake is sprinkled with sparkly sprinkles. And kissed with almond. And rum. And crunch! The most perfect crunchy crust ever has an unlikely genesis ingredient: Nature Valley™ granola bars. Say hello to the finest secret streusel on the planet. Once crunched, these babies are mixed with melted butter and sugar, then half of the mixture is pressed into a 9x9-inch pan. Once frozen, the butter and sugar hold the crust together nicely, so no baking is needed. Now grab the collection of fine filling ingredients. Once whipped together, this mixture is quickly folded together with Christmas nonpareils and spread into the crust-lined pan. Top with the remaining crunch and freeze. Perhaps the hardest part of this crunch cake is the waiting! For serious. This is the moment you wish freezers had windows, so you could press your little nose against it in anticipation. After a few hours, your Christmas Crunch Cake is ready. For best slicing, pull it from the freezer about 10 minutes before you’re ready to eat so it has a moment to soften. Then grab a fork. Your crunchy Christmas awaits!